In June of 2016, we were enjoying our first overnight weekend with Gail and Rudy. 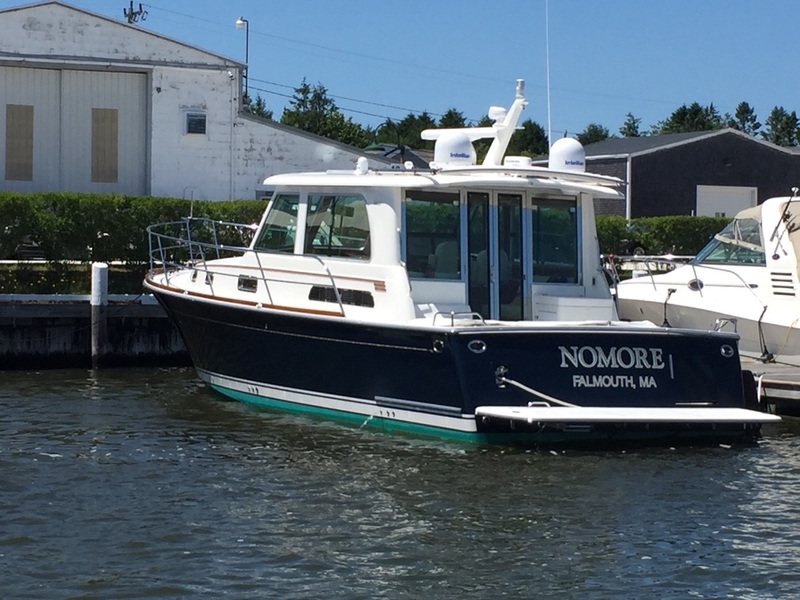 We were at the Newport Yachting Center (also for the first time), and out to breakfast at The Corner Cafe when I got this text from Joyce at BYS telling me about an incredible listing she just got for a 2015 Sabre 42. As I munched on my Portuguese egg breakfast, I had to make a major decision. Although, Tenacity was only 15 months old, the truth was that I was suffering from a mild case of Buyers Remorse; not because I didn’t love Tenacity, but simply because I was enjoying cruising with another couple and knew our boat mission had changed. I also knew Mrs. Horne when it came to big purchase decisions and the second I revealed Joyce’s text and my thoughts, she’d either snuff out my dream or jump on board and want a new boat more than I would! And with that began the shortest boat buying cycle in Horne family history. After breakfast, we fired up Tenacity and got to Falmouth Massachusetts by 1:00. The Sabre 42 was a pretty boat and an incredible deal, but after mulling it over, we concluded that it didn’t really serve the new mission. The guests were still sleeping on a convertible dinette and there was only one bathroom. The funny thing was that the whole 24 hour shopping experience had triggered the a conversation about buying a bigger boat. When I was shopping for Tenacity, I had Joyce send me brochures on every boat Back Cove made. I grabbed the one for the 41 and started studying it in earnest. It fit the new mission to a tee. The Back Cove 41 layout was actually perfect. It had two staterooms, each had it’s own head, and each had a door that, when closed, turned them into mini en-suites. I think I may have wandered on one a the Newport Boat show, but the memory was pretty foggy. Anyway, when I called Joyce to tell her we weren’t interested in the Sabre, I told her that the Back Cove 41 looked like a better fit. BYS did have a 41 stock boat on order, but the owner of BYS didn’t really want to sell it. Apparently, he’d already ordered a couple for stock and they were sold before delivery. The next one was going to arrive in May of 2017 which made it the perfect time to show prospective customers. Susan had never even seen a 41 and Joyce arranged for us to meet another customer of hers who owned a 41 — Bill and Tina at Wentworth By The Sea. That was it, the buying cycle was off to the races. Within 24 hours, Joyce was at our house and we were signing papers. Their boat was a beauty and I think Susan was impressed that they were planning on taking her to the Bahamas for the winter. That sealed the deal and the construction of Vigilant began. We took delivery in April of 2017 and in light of the unusually cold spring, we’re very happy we did. Although she’s a lot like Tenacity, she’s much better suited for our family’s new cruising mission. Beyond the extra stateroom and head, the biggest difference is the stability that comes from her extra 6,000 lbs of displacement. Also, the reverse cycle AC, which works nicely as a heater and the hardback door, makes cruising on a cold day quite comfortable. Vigilant also triggered my imagination to create My Buzzards Bay and share everything I can about the boating lifestyle here in Southeastern Massachusetts. 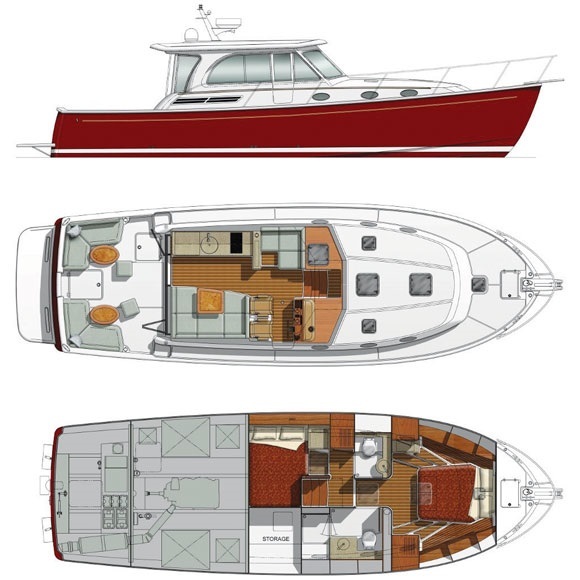 I studied virtually every boat you can buy in this class around here and I can assure you that the Back Cove 41 may be the best designed boat in her class on Buzzards Bay. Categories: Boatology, Living The Dream! Love these posts! We live a mile from Padanaram (used to live in the village and owned the Village Cafe for a bit). The Sail Loft is a favorite joint! MAKO 23 docked at Davis-Trip Marina. Maybe we’ll run into you sometime. I’ll buy the beer. Looks like a really nice boat and perfect for the mission. I’m curious as to the fuel usage. On Lake Michigan, ethanol free fuel can be quite expensive. It’s a diesel. Back Cove is a really unique Maine builder. They build really high quality boats with low maintenance designs. Virtually no exterior wood and big single Cummins. Tenacity (Downeast 37) had a 600 HP and Vigilant is 715. Tenacity was really efficient – burned maybe 1.1-1.2 gallons an hour. Vigilant weighs 25% more and she’s more like .9 gallons/hour.